… but you can play around with all that another time. today we’re focussing on extending the functionality of the image resize script from that post to make it a little more user friendly. rather than a have script that’s hard-wired to scale images to 500px high, we’ll create one that can accept user input, so that the pixel dimensions can be changed each time the script is run. to do that we need to first create a dialog. 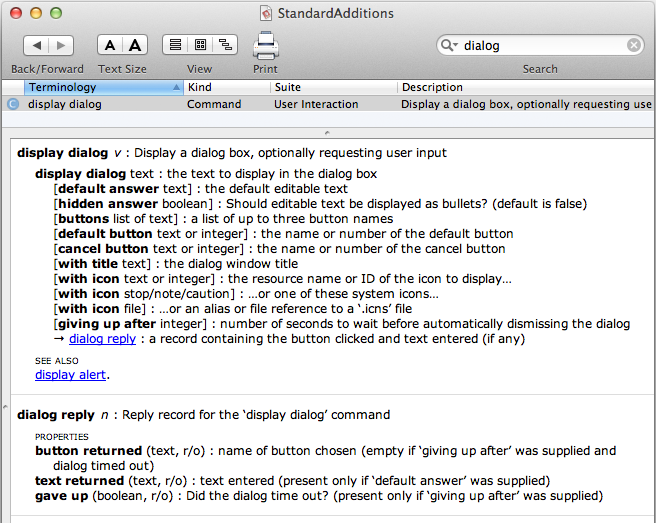 unfortunately the dialog possibilities with standard applescript are pretty crap — particularly when compared to all the options available to applescript dialogs in InDesign – border panels, columns, rows, checkbox controls, dropdowns, enabling groups, event listeners, comboboxes, editboxes, radiobuttons, etc. … which gives us two pieces of information — the text entered and the button clicked – both captured into variables. if you want to make the script fool-proof, you’ll need to add some error handling to ensure that the text entered is an integer. but in its current form, the script assumes that the user is not an idiot. set mgScriptString to "sips --resampleHeight '" & mgText & "' "
set mgScriptString to "sips --resampleWidth '" & mgText & "' "
set text item delimiters to "/"
save that as an application and whack it in your sidebar. drag and drop as many images as you like onto the app — they’ll all be scaled quicker than you could do it through photoshop. don’t worry about accidentally dropping non-image files — these just get skipped. 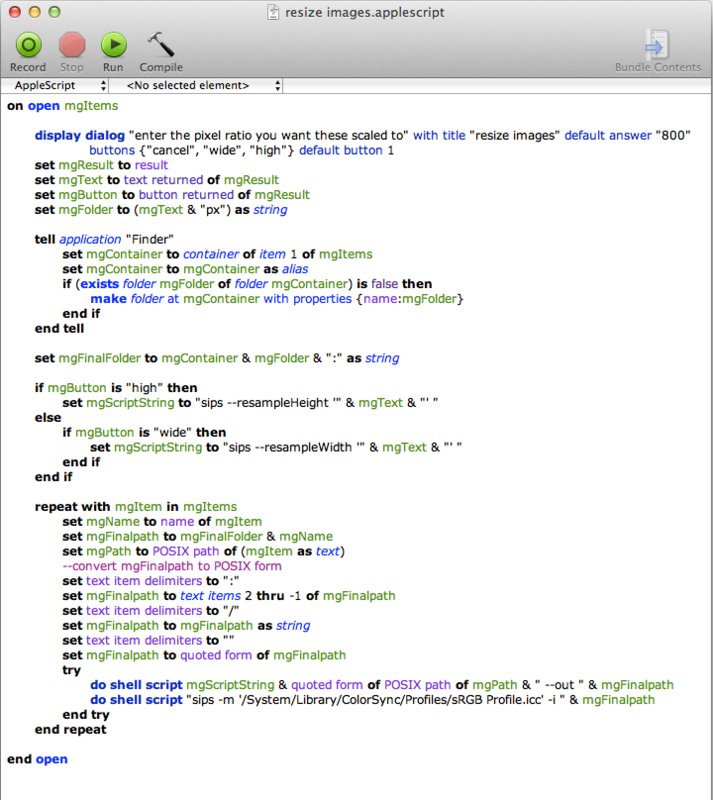 you can also go here to get the complete image processing script. This entry was posted in applescript, OS X and tagged applescript, how to, images, Mac, OS X, OSX, photoshop, resizing, scaling, sips, tutorial by macgrunt. Bookmark the permalink.